From April 2014 it became a national requirement for all inpatient services to display and publish their staffing levels. This is part of the NHS response to the Francis Inquiry. Patient safety is very important to us. We already have measures in place to make sure that our wards are safely staffed. When you visit one of our 13 wards at Lynfield Mount Hospital and the Airedale Centre for Mental Health you will see our ‘staffing level boards.’ These show the planned and actual numbers of staff (registered nurses, clinical support workers) on shift each day. This does not include support staff, such as ward clerk, housekeeper. 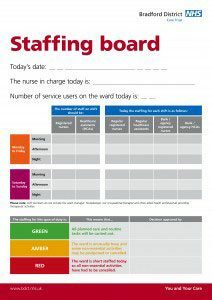 The boards are displayed on each ward where they can be clearly seen by service users, visitors and staff. They show who is in charge of the shift that day, when the board was last updated, and if the person in charge feels that the ward is safely staffed at that time. Every month we will publish information about our staffing levels. You can access the paper discussed in public at our Trust Board meetings on the board papers page of the website. The Board will hear if our wards are meeting the safer staffing requirement, if action is needed and what steps are being taken to make our wards as safe as possible. If you would like to discuss the staffing levels of our wards you can talk to the person in charge on the ward at the time that you visit.